FINAL TEXT (ZETA): B2 has a 40% chance to reduce its cooldowns by 1 whenever a Separatist ally is evaded or damaged by an attack. Whenever B2 inflicts a debuff, all other Separatist Droid allies gain 5% Turn Meter. Question: is that supposed to read separatist and droid or specifically separatist droid? Hmmm not sure how I feel about this yet. B2 is the only classic droid I don't have at 7 stars, but it looks like a solid rework. The additions to his first unique will definitely have some fun potential with IPD's zeta. This is awesome. Can’t wait! Yes, so happy. Scoundrels and droids are my favorite. Sidious is my favorite sith too, i hope he gets reworked soon now. Yeah, my favs too, although droids have kinda taken over my heart. wow, the droids are coming! He hardly needs a taunt. He punishes the enemy so much for targeting anyone else. I dunno about you guys, but he’s generally my first target. Thinking Ewoks will easily dispatch these droids so far. I was hoping to see a taunt on all three of them. How do you figure? I guess just because it's a 40% chance * 5 for the AOE? He already has a taunt-less taunt because of his unique. Naturally people target him, to neutralize or sometimes until death, or else he keeps getting turns and aoe dispelling. Fighting against Jedi with foresight up constantly he is going to be a TM machine. All of the videos released today announcing the new reworks have a timeline showing that the B2 gets his re-work today 2-6. Will there be a game update rolling out later today? I was wondering the same thing. Thanks for posting the question. Where does one see these videos? Perhaps @CG_SBCrumb has a clarifier? "FINAL TEXT (ZETA): B2 has a 40% chance to reduce its cooldowns by 1 whenever a Separatist ally is evaded or damaged by an attack. Whenever B2 inflicts a debuff, all other Separatist Droid allies gain 5% Turn Meter." 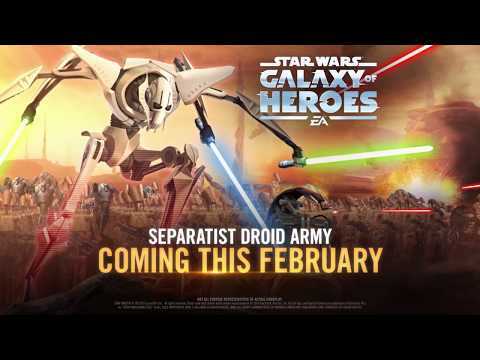 What exactly is a "Separatist Droid"? Since they are different tags???? Maybe they’ll get a new tag. Separatist Droids have both the Separatist tag and the Droid tag. A Separatist Droid is a Separatist that is also a Droid. There are four Separatist droids now. B1, B2, IG-100, and Grievous are all Separatist droids, as far as tags go. This guy looks to really punish Jedi (many buffs) and AOE guys like Troopers. And ironically, the old toons from the dodge meta, like Old Ben. But Thrawn's Fracture will take care of him, along with Nihilus and others. Might see Chopper in GA/TW for his dispel+stun ability vs the taunting tank (magna or droideka) so you can hit down B2.